Where should the hammer hit the string? How does a soundboard vibrate? My presentation will be an overview of some of the ways in which the design of a piano affects its tone and acoustical performance. It is not possible in a short lecture to mention all the important factors, because so many things in a piano affect its sound. Fig. 1 shows the oldest existing piano, the Cristofori instrument of 1720, which is in the Metropolitan Museum at New York City. In a recorded excerpt we can hear this historic instrument followed by the familiar sound of a contemporary concert grand (sound example 1). Fig. 1. 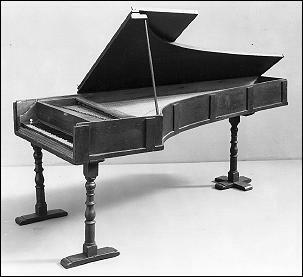 Cristofori piano of 1720. * (By permission of the Metropolitan Museum of Art, New York: The Crosby Brown Collection of Musical Instruments, 1889. Piano Forte (89.4.1219): compass 4 octaves and one quarter (C - F), Italian, Florence, 18th C., 1720. Maker: Bartolomeo Cristofori.). It is obvious that the extreme differences in design between these two instruments produce extreme differences in tone quality. From time to time we will refer again to the oldest piano, but in order to concentrate on acoustical factors we will ignore or mention only briefly some of the important mechanical differences. 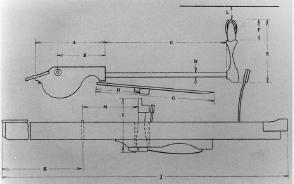 For example, it is evident that the action of the 1720 piano (see Fig. 2, Pollins 1984) is much simpler and less controllable than that of a modern grand. After listening to the recording of the old piano one can say almost with certainty that the music that was played on the modern instrument could not be played properly with the action of Cristofori. Fig. 2. Action of 1720 Cristofori piano. (By permission of the Journal of the American Musical Instrument Society).